Instituto Pedro Nunes (IPN) focuses its efforts on high level continuous training, directed at professionals seeking updates in new technological domains, the preparation of specialized technicians, and the qualification of unemployed graduates. In addition, IPN promotes training directed at young entrepreneurs to leverage the creation and incubation of technology-based companies. This training activity is based in a strong connection to the University of Coimbra and other R&D institutions, and to the network of companies that collaborate regularly with IPN, covering complementary training areas and profiles. The Innovation and Knowledge Transfer Unit (DITS), which is the University’s contact for companies and organizations aiming to take advantage of the institutional potential for businesses, is responsible for coordinate the university activities such as: the institutional interface of the University of Coimbra with external entities for innovation and technology transfer issues; Technology Transfer and Innovation Project Manager; IP management and commercialization; creating awareness amongst the community regarding entrepreneurship, innovation and tech transfer. Several initiatives are organized at DITS such as entrepreneurship courses and conferences about innovation and entrepreneurship. The main goals of the Master’s Degree in Geriatrics are: to describe the main biological and anatomical changes associated with the ageing process and to understand the associated pathophysiological processes; to recognize the diseases and other problems most prominent in the elderly; to identify the behaviors that enable active and healthy ageing; to distinguish between physiological ageing and pathology; to adapt treatment according to age; to raise the awareness of other health professionals and the general public of the importance of the problems associated with an ageing population; and to propose research projects in Geriatrics. The Master Degree in Biomedical Research aims to create conditions for the development of differentiated and training of high scientific merit that prepares students to carry out research activities in Biomedicine. The main scientific areas of this master’s degree include Vision Sciences, Neurobiology, Oncology, and Infection and Immunity. The Programme offers excellent training opportunities for research into ageing, development and chronic inflammatory diseases. The major hallmarks of this programme are the high degree of inter-institutional collaboration and the mobility of students and faculty between the three affiliated universities. The Doctoral Programme in Health Sciences (Medicine, Dental Medicine, Biomedical Sciences, Health Technologies and Nursing fields) is coordinated by the Faculty of Medicine of the University of Coimbra. The training activities of this course are designed to expose students to specific research problems in several areas of knowledge related to Health Sciences. The doctoral course is supported by excellence in training associated with excellence in scientific research in Medicine and Biomedicine. The scientific areas of the Programme involve fundamental research questions, including cellular dysfunction and molecular mechanisms of diseases related to ageing, neurodegeneration and oncobiology, as well as clinical and translational research themes, including degenerative dysfunctions of the retina and brain, chronic inflammatory diseases and neoplastic diseases. This program is aimed at the training of competencies, skills and multidisciplinary research methods, in objects of study that integrate physical education, physical activity and sport training in their multiple social and professional expressions. The PhD course in Sports Science is organized into four specialties (physical activity and health, physical education, special needs education, sport training), including specific and interdisciplinary aspects. The physical activity and health branch focuses on the epidemiological evidence that links physical activity to health and disease. It allows a greater understanding of the mechanisms involved in the physiology and psychology of physical activity and health. It examines the combined effects of physical inactivity and other risk factors such as poor nutrition and smoking in health status. It also considers the role of physical activity in the prevention and control of chronic diseases. It covers the issues of health promotion and physical activity for different populations, as well as the methods of measurement for health and quality of life and impacts at the level of social management and public health. The PhD Program in Experimental Biology and Biomedicine aims to train highly skilled professionals that will be internationally competitive in terms of fundamental scientific research, the development of novel therapeutic and diagnostic tools, relevant clinical and pre-clinical models, as well as biotechnological applications. The programme provides advanced research-oriented training in emerging areas of Biology and Biomedicine, such as Molecular Cell Biology, Neuroscience and Disease, Molecular Biotechnology, Medical and Environmental Toxicology, Biophysics and NMR, Microbiology, Development and Human Fertility, and Visual Sciences. The University of Coimbra (UC) is Founder Member of Coimbra Group (association of long-established European multidisciplinary universities of high international standard). The University of Coimbra is a reference in higher education and R&D in Portugal, due to the quality of the courses taught at its eight faculties and to the advances achieved in pure and applied research in various scientific domains and in technology related areas. UC pursues a policy of continuous improvement in several areas, ensuring high standards of teaching and research as well as being an active participant in the development of the corporate world. The continuous technological development promoted by UC’s different R&D units addresses the challenges involved in the design, operation and regulation of technologies, bringing together teachers from different scientific disciplines with a long experience in teaching, research, technology transfer and consultancy in different areas in the context of technology. UC offers advanced training programs in different areas connected to science and technology, with special emphasis on those related to MIT Portugal and UT Austin Programs and Associated Laboratories, like ADAI (Association for the Development of Industrial Aerodynamics), CNC (Centre for Neuroscience and Cell Biology), IBILI (Institute for Biomedical Imaging and Life Sciences), IMAR-CMA (Marine and Environmental Research Centre), INESCC (Institute for Systems Engineering and Computers at Coimbra), ISR-UC (Institute of Systems and Robotics - University of Coimbra), IT (Telecommunications Institute – Coimbra Centre) and LIP Coimbra (Laboratory of Instrumentation and Experimental Particle Physics). Its offer in technological research makes UC an undeniable reference in R&D in Portugal, highlighting the excellence of the work developed by the R&D units of UC under the umbrella of the Research Faculty III (Institute for Interdisciplinary Research): in particular CEMUC – University of Coimbra's Mechanical Engineering Research Centre; CEMDRX (Centre for the Study of Materials by X-Ray Diffraction); CFC (Centre for Computational Physics); CISUC (Centre for Informatics and Systems); CI (Instrumentation Centre); CIEC (Research Centre for Civil Engineering); CIEPQPF (Chemical Process Engineering and Forest Products Research Centre); CMUC (University of Coimbra Centre for Mathematics); CQ (Centre for Chemistry – Coimbra) and CFE (Centre for Functional Ecology), besides the previously mentioned Associated Laboratories. UC also stands out in technology transfer and is involved in the promotion of several initiatives, like Instituto Pedro Nunes Incubator and Biocant, and in the creation of diverse technological spin-offs, such as Active Space Technologies, Artscan, Crioestaminal, Critical Software, Feedzai, InfoGene, Inogate, iNovmapping, ISA Intellicare, Luzitin, Move Mile, Sensebloom, SPI and Take The Wind, amongst others. The University of Coimbra today is an example of dynamism in its constant search for improvement and enhancement of knowledge, research and technology, contributing decisively to the improvement of science, technology and to the enhancement of knowledge as an essential element of people's lives. CNC.IBILI is a new biomedical research unit in the Centro Region of Portugal, resulting from the fusion of two research institutes of excellence in Coimbra: the Center for Neuroscience and Cell Biology (CNC) with a long tradition in cell and molecular biology and neuroscience, and the Institute for Biomedical Imaging and Life Sciences (IBILI), a research institute from the Faculty of Medicine of the University of Coimbra, with an established record in visual sciences and functional bioimaging. The merging of CNC and IBILI results in complementary approaches and expertise, creating the conditions for the new unit to consolidate its position as a national leader and as an internationally recognized reference in the field of Life Sciences. The expected outcome of this merge includes publications in top ranked scientific journals, effective translational activity from R&D facilities to clinical practice and business companies, and substantial regional economic growth by 2020. The UC-CNC.IBILI unit incorporates biomedical researchers (220 PhD integrated members, 253 PhD students and 50 dedicated management staff) from the Faculties of Medicine, Pharmacy, Science and Technology, the Institute for Interdisciplinary Research and Coimbra Hospital and Universitary Centre, and outstanding technological infrastructures, including the Microscopy Imaging Center of Coimbra (MICC), the Institute for Nuclear Sciences Applied to Health (ICNAS), the NMR Platform, the Mass Spectrometry Unit, the Flow Cytometry Unit and a state of the art Animal Facility. The scientific program is organized into three main areas: Neurosciences, Vision and Brain diseases; Metabolism, Ageing, and Disease; and Molecular and Stem Cell-based Therapies. Each area brings together researchers, technology and an international network of collaborators that fully support the proposed research program and have the capacity to tackle societal challenges. The Institute of Nuclear Sciences Applied to Health (ICNAS) is a multidisciplinary research institution of the University of Coimbra that combines the main medical imaging modalities in biomedicine, from fundamental science to pre-clinical and clinical applications. 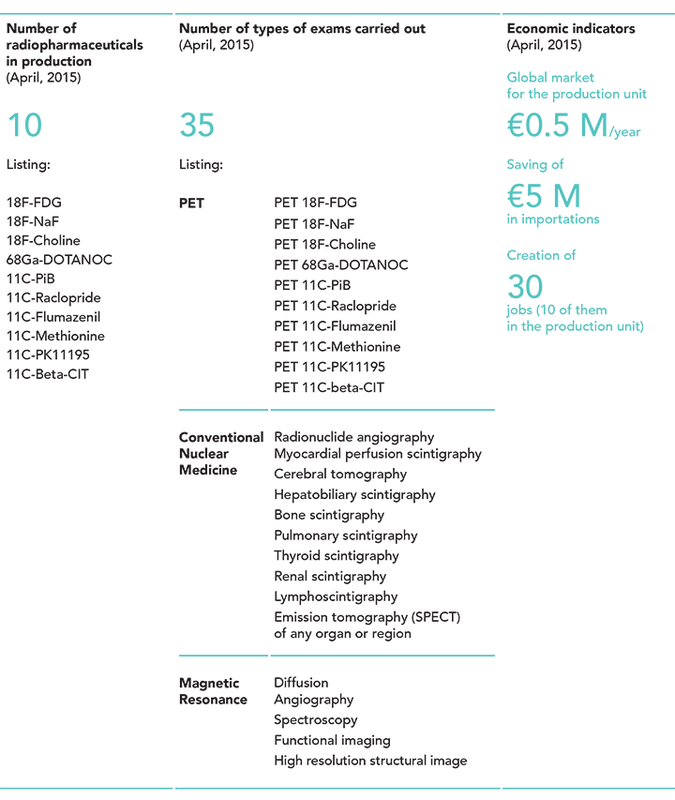 ICNAS is organized in core technological areas: Positron Emission Tomography (PET), Cyclotron and Radiochemistry, Conventional Nuclear Medicine, and Magnetic Resonance Imaging (MRI). ICNAS has expertise in various fields that include Medicine, Biology, Engineering, Maths, Physics, Chemistry and Informatics, among others. Specialized medical studies are conducted in Neurology, Cardiology and Oncology. ICNAS activities include the development of new tracers and the study of new therapies and diagnostic methods. The recent process of demographic change, reflected in an ageing world population and in the inversion of population pyramids, brought new challenges for which families, governments and society in general are not prepared. Given this situation, and assuming that the evolution will be accompanied by an increase in people with greater physical limitations, it becomes clear that the issue will represent a problem, not only socially but also in terms of medical treatment. The Information and Communication Technology (ICT) can have an extremely important role for improving quality of life of elderly people contributing to a healthier and active life. This is therefore the starting point for the concept of Active and Assisted Living. Active and Assisted Living (AAL), ICT for Health and Quality of Life are key areas of some research and development institutions in Coimbra. One of the institutions is Instituto Pedro Nunes (IPN) and has been responsible for several initiatives in Portugal and EU, related with AAL and ICT for Health, participating in projects dealing with aspects of system design and architectures and the development of the eHealth and eInclusion areas. IPN has been involved in European projects funded by Ambient Assisted Living Joint Programme (AAL-JP), the Co-living, CaMeLi and CogniWin, and in large national projects like Tice.Healthy and AAL4ALL, funded by QREN. Co-Living - Virtual Collaborative Social Living Community for Elderly, was a three year AAL-JP project which aimed to develop a community supported by ICT for Virtual Collaboration and Social Living in the Community for the elderly (Co-LIVING), stimulating and prolong an independent and active living through the advancement of social interaction, positively contributing to daily wellbeing. CaMeLi (Care Me for Life) is a two year AAL-JP project that aims to provide automated services with the purpose of assisting elderly people in their daily activities and assist in the provision of a comfortable quality of care. CogniWin is two and half years AAL-JP project that aims to provide an answer to the challenges of older adults in the workplace by providing an innovative personalized system motivating them to stay for longer active and productive in computerised working environments. TICE.Healthy is a four year mobilising (large scale) national project, which aims to develop an innovative ecosystem of ICT-based applications in the area of Health and Quality of Life. The main result of the project is an ICT platform called eVida, aiming to give the ability to care providers in the field of ageing, an effective link between the formal and informal care systems, acting in the prevention and early diagnosis, increasing the quality of life while reducing healthcare costs, which naturally tend to increase due to the ageing of the European population. AAL4ALL is a mobilising (large scale) national project, whose main objective is the development of ICT-based technologies for the healthcare and participate in pilot trials nationwide. Furthermore IPN team has vast experience in technology transfer processes, transforming research technologies into market products, and also in coordinating multidisciplinary teams. IPN research activities are mostly co-funded by european and national entities like FP7, AAL-JP, QREN, among others. The Centro Region of Portugal encloses a diversity of social care providers. This network of institutions supports frail people, fights exclusion and provides social network, intergenerational activities, science and culture awareness, citizen empowerment and health literacy. Elderly Georeferentiation – This project aims to promote the complete screening and flagging of the elderly population of the county. It seeks the prevention of isolation, abuse and victimization by scamming. It also strives for a closer monitoring and follow-up of the elderly for early diagnosis and prioritization for intervention. Household Telecare - It aims to support elderly people living alone and with low incomes to have a quicker and consolidated access to help in case of emergencies, health issues, safety, home malfunctions, or merely loneliness. By pressing a button within a device that can be connected to a mobile phone or the household phone, and that is placed on a bracelet or a necklace carried by the elderly, the proper response to each need can be triggered using remote assistance. A Table for the Grandparents – The purpose is to ensure that elderly people living in isolated conditions and/or with low incomes get the meals they need at weekends and holidays (on days the normal social care supports are not operational), by delivering meals to them in their own homes. This project is undergoing mainly in a part of the city that is specially populated by elderly people, with poor mobility conditions and with few available solutions, in relation to this matter. The Centro Region of Portugal offers a unique health hub in Coimbra, which concentrates resources, professional competence and quality services. This highly differentiated core is based at the Coimbra Hospital and Universitary Centre (CHUC) and University of Coimbra working in close collaboration with the regional health network and charities administered by the Regional Health Administration of Centro (ARSC). This ecosystem of health care providers and social work covers the population, in close coordination with local authorities. CHUC was awarded the “Sustainable Health in Hospital Care” prize by the “Jornal de Negócios” and Sanofi, in collaboration with Accenture (June 2014). The Ministry of Health gave it the Gold Medal (April 2014) in recognition of the performance of Coimbra health units in the fields of healthcare, teaching and research. Instituto Pedro Nunes (IPN) is a non-profit private organization, which promotes innovation and the transfer of technology, establishing the interface between the scientific and technological environment and the production sector. Created in 1991 through an initiative of the University of Coimbra, IPN currently has a team of almost 100 permanent staff to support startups and researchers in these activities. With a self-sustaining business model that gives the flexibility and capacity to accompany business sector needs, IPN operates in three complementary areas: incubation and acceleration of technology-based enterprises; research and technological development; and highly specialized training. IPN has supported more than 220 companies (27 in the health sector) with an export capacity greater than 35%. IPN was awarded with the “Best Science-Based Incubator 2010”. BIOCANT Park is the first Portuguese venue entirely devoted to Biotechnology. Here, advanced Life Sciences knowledge and technology are developed and applied creating value in business initiatives. Through a bold investment by the Municipality of Cantanhede and by the Center for Neuroscience and Cell Biology of Coimbra, and taking advantage of the last years’ national investment in Life Sciences, it was possible to set out an integrated development strategy to promote entrepreneurship and economic growth. The core of the Park is the R&D center – BIOCANT, Biotechnology Innovation Center – where specialized research teams use their built-up scientific competences to generate novel services and products. The scientific units of BIOCANT have committed staff and state-of-the-art equipment with high-throughput capacity. The Centro Region of Portugal offers a unique ecosystem for the development of good healthcare practices in active and healthy ageing. Opening session of the VI Regional Congress on Active and Healthy Ageing with Francisco George. Comissão de Coordenação e Desenvolvimento Regional do Centro (CCDRC) promotes the second edition of the award Good Practices in Active and Healthy Ageing. This meeting, organized by the Ageing@Coimbra Consortium is another milestone in the history of this consortium, as it managed to reunite 400 participants from 130 different entities of the various sectors of society, to debate the Ageing challenges in the Centre Region. To this also contributed the II edition of the Good Practice Award on Active and Healthy Ageing, an initiative of CCDRC and Ageing@Coimbra, which this year exceeded all expectations of the organization, in terms of number and quality of the applications presented.